1 What is Korean Aegyo? 2 Who Uses Korean Aegyo? If you want to add some cuteness and adorability into your Korean, then aegyo may just the thing you need! One reason for acting cute is to try and flirt with or a guy or girl that you like. It can also be used to get something that you want. Aegyo is a great way to show affection to your friends, family, or loved ones. However, it’s not for everyone–we’ll explain below! If you are impressed by somebody’s aegyo, then you can say ‘귀여워요’ (gyiyowoyo) which means ‘cute’ in Korean (dictionary form: 귀엽다). 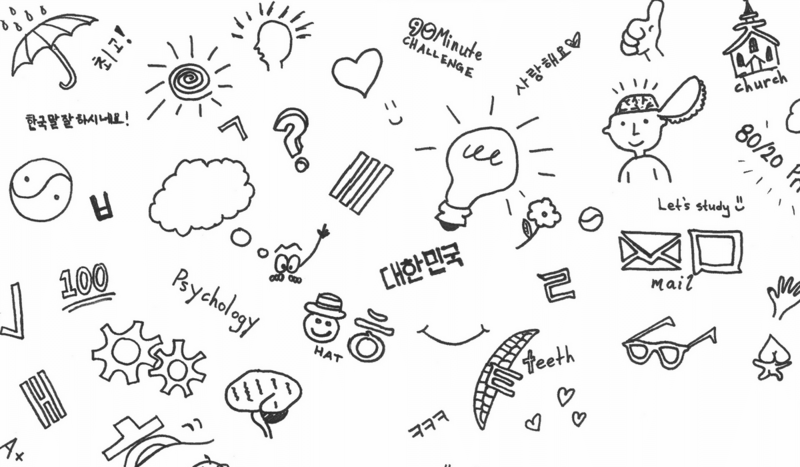 As you might have guessed, this post will use a lot of Hangul, the Korean alphabet. 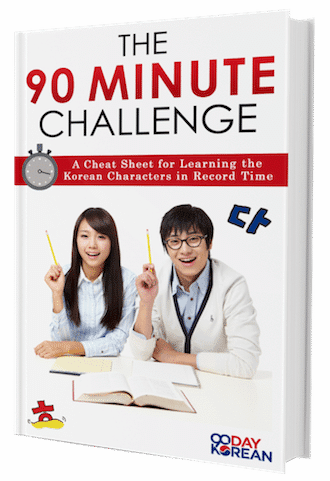 If you can’t read the Hangul it is possible to learn in just ninety minutes, so what are you waiting for? 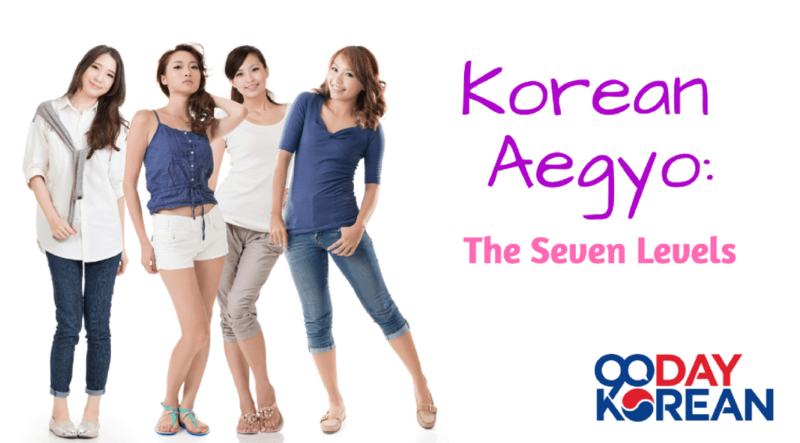 Korean Aegyo is generally performed by women, although some more feminine guys might use it too from time to time. If a regular guy uses aegyo, then you may feel uncomfortable or weirded out. Having that kind of aegyo experience might even cause you to get 닭살 (daksal or ‘goosebumps’)! . Of course, most people don’t use aegyo in an extreme way. In fact, quite a lot of people really hate it! The more ridiculous examples of aegyo can often be found in Korean dramas or on comedy shows. Those examples are very different from how people might use it in real life, since Korean dramas themselves aren’t a particularly accurate portrayal of Korea. If dramas were an accurate portrayal of Korean life, we would all be living in the one authentic hanok available to rent in the whole of Seoul. Or, we might be living in a one room apartment overlooking the Doota shopping mall. We would also be dating a chaebol heir/heiress with a secret past and whose evil mother hates us. It’s a complex life! The word Aegyo is often used with the word ‘부리다 ‘ (bulida) to make ‘애교 부리다’ (aegyo bulida). This means ‘to act in an aegyo way’. There are different levels of aegyo. Some aegyo is used by lots of people and generally accepted as reasonable behavior in public, while other aegyo can be quite extreme! Take a look at the seven levels below, and decide which levels you think are appropriate to use on a date, and which levels should be left to Korean dramas and gag shows. If a word ends in a vowel, then this vowel can be stretched to sound cuter (or whiny depending on your perspective, this guy in particular hates it). The word ‘오빠’ (oppa) is a good example of this. For those not familiar with ‘오빠’, it literally means ‘older brother’. It is used by girls to refer to a guy who is a little bit older than them. Since lots of guys like being called ‘oppa’, saying this word in a cute manner has more effect than other words might. Unfortunately for guys, saying ‘누나’ (noona) in this way will not have quite the same effect. In English it is very hard to show some features of the language, such as sarcasm, when sending a text message or email. In Korea, if you want to express your aegyo in a text message, then you have a few options. One option is to add extra vowels and wavy line symbols at the end of every word that ends in a vowel. Another option that people use is to add the letters ‘m’ or ‘ng’. Two examples are changing ‘오빠’ (oppa) to ‘오빵’ (oppang) or ‘배고파’ (baegopa) to ‘배 고팡’ (baegopang), etc. Be warned, this can drive you mad if you are using a dictionary to translate somebody’s 애교 text messages! The ‘요’ (yo) at the end of many Korean sentences is also often written as ‘용’ (yong) when people are using this sort of aegyo. For example, ‘뭐해요?’ may be changed to ‘뭐해용?’. Texting in this manner is not uncommon, but some people take it a step further, adding these extra consonants (자음) when speaking. 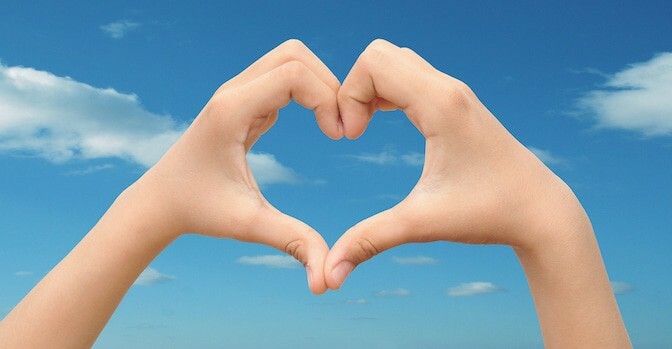 This is when someone uses their hands to make cute symbols like a heart or ‘V’ sign (The Korean ‘V’, not the English ‘V’) in situations outside of having their photograph taken. Sometimes even ajjoshis (older Korean men) can be seen making the ‘V’ sign on occasions. The hands can also be used to accentuate the face by creating mock dimples or a ‘V’ shaped chin. Watch the hand gestures in ‘Gee’ if you want to learn some new aegyo hand gestures. Pouting is also included in this level of Korean aegyo. Go to Lotteworld to upgrade to Level 4 aegyo! 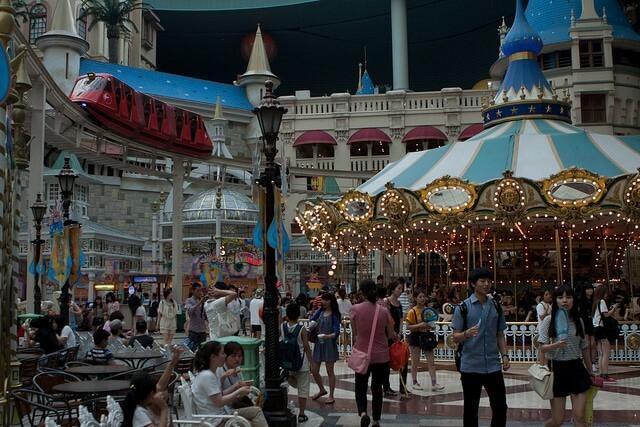 Everybody in Korea knows Lotteworld, the indoor amusement park near Jamsil Station that is open all year round. Many people have dates there and a very popular item on sale there are animal ear hairbands. They look cute and you will see lots of people wearing these around Lotteworld. Whilst wearing these inside Lotteworld is of course aegyo too, it is a generally accepted thing to do. After all, you are in a world with fairies and pirates so why not wear 호피무늬 (leopard print) cat’s ears? However, wearing these in public is not a common thing to do. Similar to level three, but now level five uses the whole body (including foot stomps and noises to go with the gestures). By this stage, we are definitely entering TV drama territory, which is a great resource for learning Korean by the way. Although this is a hand gesture, it is so closely associated with Korean aegyo, and especially the more ridiculous aegyo that you see on Korean gag shows, that it needs its own level. There are several long running jokes on Korean comedy shows which involve very un-cute actors doing the ‘bbuing bbuing’. This song pretty much sums up Korean aegyo. Watch this video to see some more hand gestures associated with aegyo. VIEWER WARNING: this song will get stuck in your head so if you really don’t like aegyo, don’t watch this video! Here is a summary list of common Korean aegyo phrases and words. We’ll show the comparison between the standard form and the aegyo form. Then, we’ll give you the English meaning. Now that you know the seven levels of aegyo, you can more easily recognize them when you see them. Of course most people don’t use a lot of the high levels of aegyo seriously except for on TV or in dramas, but the first few levels are used quite regularly. If you liked this and want more great Korean phrases then go to our Korean Phrases Page for a complete list! Which level of Aegyo would you use with your partner, and which levels do you think are unacceptable in public? Let us know in the comments below!